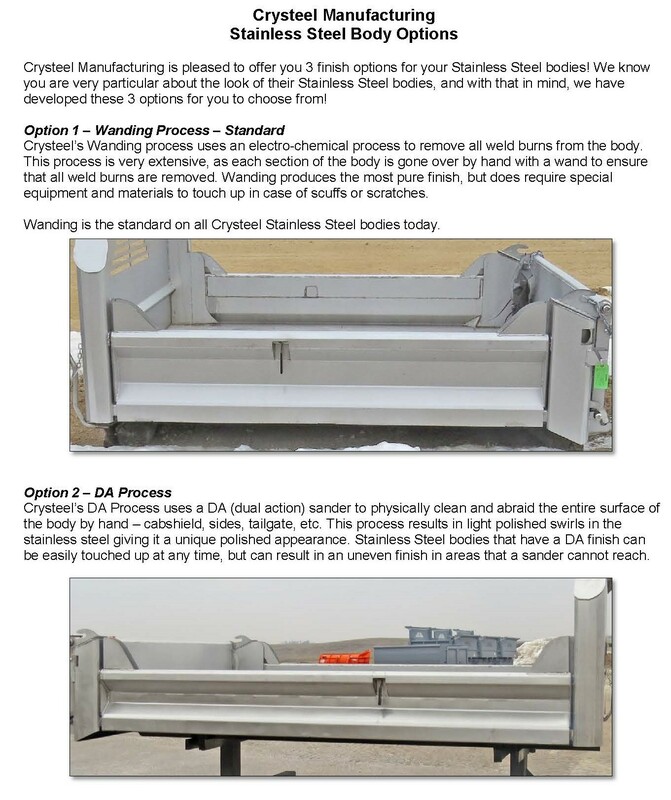 New 2019 Crysteel 11' x 96" Stainless Steel S-Tipper. 40" Front with Tapered Integral 1/4 Cabshield. 14" Fold down sides, 20" Quick-drop Tailgate. 3/16" AR450 Steel Floor, 7 GA Steel Crossmemberless Tubular Understructure. Crysteel Quick Install LB510 Hoist mounted under body with subframe and double acting 12V electric pump. New 2019 Crysteel 9' x 96" Stainless Steel S-Tipper. 40" Front with Tapered Integral 1/4 Cabshield. 14" Fold down sides, 20" Quick-drop Tailgate. 7GA Stainless Steel Floor. Crysteel Quick Install LB500 Hoist mounted under body with subframe and double acting 12V electric pump. 40" Front with Tapered Integral 1/4 Cabshield. 14" Fold down sides, 20" Quick-drop Tailgate. 3/16" AR450 Steel Floor, 7 GA Steel Crossmemberless Tubular Understructure. Crysteel Quick Install LB500 Hoist mounted under body with subframe and double acting 12V electric pump. New 2019 Crysteel 11'6" x 96" Stainless Steel S-Tipper. 40" Front with Tapered Integral 1/4 Cabshield(10GA 201 Stainless Steel). 16" ALUMINUM Fold Down Sides with Box Top Rail. 7GA Steel Floor. Western Tubular 10GA Steel Understructure, 7" Longbeam Height. Crysteel Quick Install LB500 Hoist mounted under body with Subframe and Double Acting 12V Electric Pump. 40" Front with Tapered Integral 1/4 Cabshield. 14" Fold Down Sides with Box Top Rail, 20" Quick-Drop Tailgate. 7GA Steel Floor. Crysteel Quick Install LB500 Hoist mounted under body with Subframe and Double Acting 12V Electric Pump. 40" Front with Tapered Integral 1/4 Cabshield. 14" Fold down sides, 20" Quick-drop Tailgate. 10GA 201 Stainless Steel Front, Sides, and Tailgate. 3/16" AR450 Steel Floor, 7 GA Steel Western Tubular Understructure. Crysteel Quick Install LB510 Hoist mounted under body with subframe and double acting 12V electric pump.